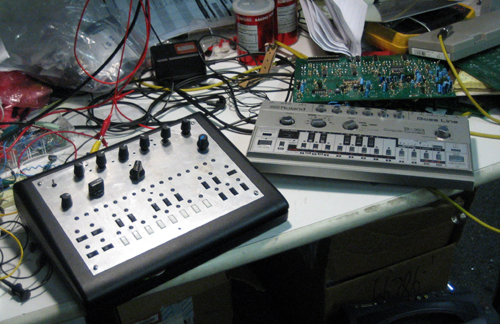 Our friend Phillip at MAKE: Blog links to new photos of the DIY clone of Roland’s legendary TB-303 synth, the x0xb0x. This is one serious project: MIDI-enabled, and with a full synthesizer. The specs are totally public domain and available online so you can build your own. Watch jonnay build one in a flickr set, either to get up the nerve yourself or just live vicariously. By the way, if you haven’t already read the excellent Make Magazine, it’s full of this sort of stuff. There are some nice simple projects for those of us who are less brave, too. Check out a recent FYI on where to buy.